"It really shows what's been going on in the Arctic – it's falling apart." | Watts Up With That? "It really shows what's been going on in the Arctic – it's falling apart." Another warmist in the Arctic: GE sponsors 15-year-old on polar trip. Shortly after twice reporting a temperature of -34 C, he suggests that the ice is “falling apart” around him. Parker Liautaud, 15 years old, is reporting on his progress skiing his way to the North Pole. He has made his goal to become the youngest person to ski to the North Pole, and to use that attempt to bring greater awareness to the urgent environmental issues of the arctic. And more importantly for his purpose of letting the world see the ravages of global warming on the arctic – There was a lot of open water today. It really shows what’s been going on in the Arctic – it’s falling apart. Right now we’re camping on this patch of old ice, but all around us is open water, broken and thin ice. To our north there’s a massive pan of very thin ice. Everything is freshly frozen, if not open. That’s called “leads” kid, part of the regular landscape well before your trip. Oh but wait…what is the Temperature? Thanks to Twitter reports we know. Normally if you’re the teenage child of a multimillionaire, you might expect a nice car or designer clothing as a present, VentureBeat reported. But if you’re the 15-year-old scion of Bernard Liautaud, who founded and later sold Business Objects to SAP for $6.78 billion and is now a partner at Balderton Capital, you can probably do a lot better. Mr. Liautaud fils rounded up a sponsorship from G.E. for a trip to the North Pole promoting environmental awareness. Of course, anybody can go to the North Pole, and blog about it, by paying a tour guide like this one that is with the 15 year old right now. Parker’s journey is part of an expedition that is open to the public. For more than 10 years, Doug Stoup has been guiding teams across the frozen Arctic Ocean and Antarctica. From numerous ‘Last Degree‘ treks to his most recent 660-mile epic journey to the South Pole. Cost: €25,700 but for a quickie (I’ll bet you didn’t know you could do this as a quickie), fly from Longyearbyen to Ice Station Barneo, then take a helicopter to 89.599? North. Spend some quality time on the ice for photos and celebration and then return. Cost: €16,900. I always like to encourage young minds in science, but this is just a glorified field trip with a guide. What a bunch of suckers GE is for paying for such an expedition. 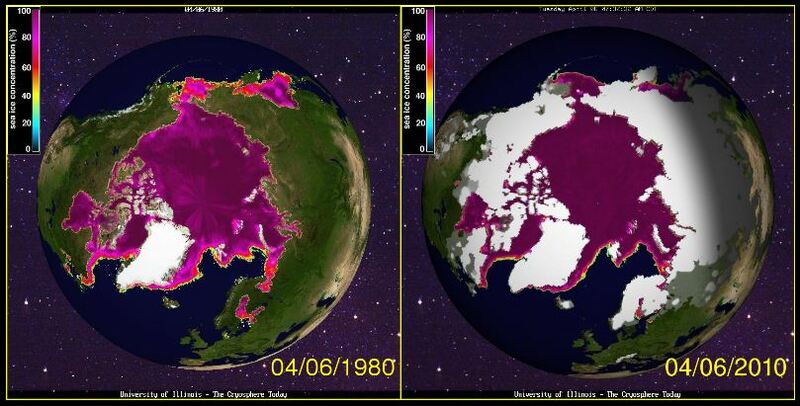 The ice from Cryosphere Today looks better than 30 years ago. April 7, 2010 in Arctic, Ridiculae. I’ve really got to think hard about selling my GE stock. What a bunch of nonsense. GE’s Immelt has been serving gallons of the green koolaid too. GE stands to gain enormously from energy related mandates from western governments (subsidies and industrial upgrades). He is in cahoots with MIT’s President Susan Hockfield both preaching unfounded doomsday scenarios and helping stuffing MIT with funding grants. It would be funny if it was not all so disgustingly dishonest – pigs at the trough. There are always well funded fools who are quickly separated from their money. Daddy made a cool 6.8 Billion and they had to sucker GE to foot the tab? I guess daddy likes playing with OPM. How’s the poor rich kid going to react when he grows up and discovers Dada let him go out and make a complete fool of himself at such a tender age? On second thought, it probably won’t really affect him because by that time he’ll have been inducted into the school of “Truth doesn’t matter, but there’s money to be made in publicity – any kind of publicity”. Ernest Shackleton and the rest of the crew of the [i]Endurance[/i] must be rolling their eyes. The ice heaves, groans, splits, and moves. Routes open and close, and Shackleton’s crew pushed and carried their boats to take advantage of patches of open water until they could get free of the ice and get stranded elsewhere. In the arctic, people are like little ants on frozen flotsam trying not to die in one of a dozen horrible ways. There’s a reason the permanent human population on the arctic sea ice stubbornly remains at zero, and it’s not because lettuce doesn’t grow there. On the other hand, should this kid survive his journey, both it and his father’s money is bound to get him laid with scores of hippie chicks. So he needs to ask himself one thing: Does his father prefer that he tragically die a horrible death while innocently trying to save the planet, or is his father betting on plan B, that the kid survives and moves in with a couple of hippie chicks, leading to a life of disolution and ending in an inevitable drug overdose? Option C, that the kid is rescued by a US attack submarine investigating a crashed alien space ship, then transported into the alien space ship and eventually to an alien planet, though unlikely, would still get him out of the house and out of dad’s hair, so it would also satisfy dad’s goal. If I was fifteen and surrounded by hundreds of miles of heaving ice, that’s what would be running through my head. How about you? Sooner or later, “The naked north will win in the end” paraphr. Robert Service. Please visit to participate in “The next big scare” competition. It’s the worst he’s seen in his entire life! 25,900 Euros. Wonder how many children in a thrid world country could get food, medicine, and clothing for that?? Oh, sorry, humans are the cause of the problem and should be killed, er, culled till they can’t damage Gaia. I hope this kid won’t increase his carbon footprint unnecessarily by needing a rescue team to save his sorry backside from getting frostbite. Yeah just a stoopid PR effort. As Dave Barry once said “yet another billionaire idiot wanting to balloon around the world.” Same idea. I’d not be sad if the little snot lost his life and his father was sued. Bet they have a chopper on standby at $50,000 per day to save their a$$es if need be. However, I do have a serious query. Can someone enlighten me please. So EVERY year about 2/3s of the sea ice disappears. Ergo every year about 2/3s (+/-) of the winter sea ice is new. So what is the real story on multi-year sea ice? Seems to me there is never more than 1/3 that is multi-year anyway. Parker L: Trip going well. The guys call me BB, because I’m like a bullet. They let me wear the red parka, which is like the yellow jersey in the Tour de France. Doug S: We’ve put Bear Bait (BB) in the red parka, which we hope will act like a red shirt on Star Trek and will let us see charging polar bears before they threaten the rest of the crew, who don’t continually whine and complain that the ice is less than perfect. G-d help me, I’m never having children. How is this for a bumper-sticker? And with just a little luck, his publicity stunt will coincide with the news that the Arctic sea ice finally did crack the long term average on the NSIDC plot. I wonder how his GE sponsors will feel then. Tonight’s JAXA figures show an increase for 4/7 and if the 4/7 NSIDC number does likewise, their plot will bend upwards (maybe retroactively). We’ll know by lunchtime on 4/8. It’ll probably take a couple more good days to nail down this milestone but the weather conditions give it a good shot. If we don’t get it this week, we’ll stay in striking range. It’s bound to happen eventually. I would rate the actions of the parents allowing this stunt as child abuse. What a stupid justification “bring greater awareness” Is there anyone on the planet who hasn’t seen awareness stunts by the score? Either it doesn’t work at all or it isn’t needed take your pick. How often is “awareness” going to be used to justify a foolish counterproductive stunt. When this kid is injured or killed will his parents and the idiots who fed him this line of rubbish be prosecuted? They certainly should be. GE is trying to prop up the huge profit for no production they plan to make from carbon trading. The life of one teenager means less than nothing to them. I don’t think that GE are suckers for paying for this expedition. Given the mega $$$ of future profits that they hope to lock in as a result of rent seeking tax payer funded sales of renewables such as wind power and solar… I would conclude that they are simply ruthless and without scruples rather than ‘suckers’. This expedition is simply marketing for their scam, same as the caitlan expeditions. I would be curious to know if the actual $ were drawn down from an internal GE marketing budget. If it’s too difficult to argue with skeptic science, conduct a circus. I wouldn’t call GE a bunch of suckers. This is cheap advertising. If overpopulation is the next big hype, they’ll be marketing the products to eradicate that problem. How long before this happens in the US and UK? Note what caused the tipping point: high energy prices. Catlin has now traveled over 30 miles in only three weeks. They probably should have taken Lewis Pugh’s kayak instead of a human powered dog sled. OT but good anti-alarmist story. Anthropogenic Mud Season, or is it the Sun? Just keep right on gaining. Journalists report on the sexual trysts of many noted personages. And the marriage break-ups that might result. Journalists relay, with bated breath, tales of celebrities cavorting about town, high on … something. They are equally excited to report on the state of dress (or undress) of these celebrities. And now these same sort of journalists are barely able to contain their excitement in reporting on the antics of a spoilt child cavorting about the world, offering up his worldly wisdom on the state of the Arctic and the world’s climate. Oh look. The ice is melting. And it’s cold out. It is unprecedented. How do we know? The press release told us so — as did a well sponsored child. And so we let you know. Research? Naw, we don’t do that sort of dirty work. That’s for the simple-minded reporter. We have a child providing us with inspiration. Meanwhile, the Catlin adventurers press on. They’ve been self-promoted as being so experienced in the ways of the Arctic. This must be why they came up with the silly idea last year of a 1,000 km in 100 days trek, taking them into the month of June, long past a safe retrieval by plane. Looks like this year they’ve tempered their plans after last year, by locating much closer to the pole. Let’s hope they don’t push their luck and try to make it to the pole in spite of the evidence that the ice around them may be too thin as the season progresses. It’s the dirty rotten ice again! It’s back this year too! Can anyone explaing how the second year ice (or multi year ice for that matter) reduces in size from September 2009 to March 2010 per the NSIDC exhibit in their April 6th story? How are they determining this? With ice birthday parties? Isn’t it about time we charge such people who make exaggerated claims and lies, to bring them to account in a court of law? I’m sick to death with such childish acts that make out to be “scientific” and “truthful” when in fact they are the exact opposite, as true science can prove very easily in any court of law using historical data. In fact why doesn’t someone go out of their way to prove that the Arctic is very healthy and strong. The reason is simple. We are to busy trying to make a living. Obviously there are too many left wing crackpots around who have nothing useful to do looking for any reason to try and keep the AGW fraud and hoax alive. Looks like his numbers are from the daily graphic which is 3 day running averaged. I believe your link shows the unaveraged daily readings. General Electric theater has done a 180. What is the point of the 2003 ice data? Given all the complaints about open water I think I would opt for one of this company’s fine products for the trip. The H2OEX and HYDRA-TERRA look more expedition worthy, but to do it with style the TERRA-WIND or HYDRA-SPYDER would even put the Top Bear boys in their Toyota to shame. oops, Top Gear of course! JAXA posts “today’s” figure around 10pm eastern time but revises it (usually upwards) to a final figure around 11pm eastern time. It is a useful predictor of what the next day’s NSIDC posting will look like. Um, this photo is supposed to be on the sea ice? then can someone please explain the tower to the person’s right, and maybe up ahead? I didn’t realize that timber was so able to grow on rotten ice…. I don’t have my calculator handy, can anyone remind me what 10% of 14.4 million is? Looks to me that he’s getting the data from the same source, just not up to date. There are only two differences that I found. On April 4, he shows 14,264,219 – which was probably the preliminary figure for the date. The revised figure is 14,280,781. The figure for April 7 of 14,220,781 is also today’s initial figure; the revised value is now listed at 14,235,625, though at 1 am EDT the figure showing on the graph itself was still the initial value. And before some folk have themselves some sort of seizure, it looks like his point is that (since I too can read the numbers) the ice extent for 2010, in relation to 2003, is ‘gaining’ in that the ice in 2003 melted faster than this year’s ice is melting. Nothing more. Whenever I see children used for propaganda purposes, I’m reminded of the scene in “Cabaret” where the beautiful, blond Hitlerjugend sings “Fatherland, Fatherland” to a people in a crowded restaurant. GE are also promoting Cap & Trade … great for business when you’re a world leader in manufacturing nuclear power stations and windmills. I wonder what grants they give towards AGW ? And I have seen the graphic # replace the csv number before, so I take the conservative value until the thing settles down. Otherwise, all the values come from the csv file. I remember you earlier promise “it looks like its going to be a heck of a melt season”. As hype goes your reckless prediction of a minimum of 4.5 million sq k without any evidence to support it also smacks of hype does it not? The required ice loss over the next six months would have to be incredibly steep if your prediction were to come true would it not? We all have preconceptions and prejudices, what we must do is try to temper them with logic derived from evidence. I will be tracking the melt season or lack of it and I will remind you later in the year of your assertions. Hype? Oh no, I just like to observe trends getting the heave-ho, as they eventually all do. Eventually, R. Gates, the whole thing will resemble an orchestra piece and come back to the key note. Bob, sure. All of a sudden the “gold standard” is 25% density rather than 15%. That is called “norming”, an “adjustment” , or “homogenization”. It would be a horrible SG-1 movie because most really good SG-1 episodes involve an immediate and catastrophic threat to either the Earth or some other habitable planet. In contrast, AGW at its worst threatens to raise Kentucky’s temperature to that of Tennessee over a century. I can’t even tell the difference in the two climates, much less complain about it! The SGC would put the threat of AGW at the absolute bottom of their priority list, right below, well, every other threat they’ve ever encountered, and then down below even the lamest potential threat ever proposed by an Area-51 researcher punching time until his retirement kicks in. At the devastating rates suggested by the worst IPCC scenarious, you could still hack two legs off a turtle and be confident that it could crawl fast enough to stay ahead of the changes. The truly scary thing is that allegedly sentient human adults are frightened to death by it, whereas the two-legged turtle with a brain the size of a pea will cope just fine. Ooops! I misunderstood your last post. Jaxa often change the estimate depending on the time of day. They may also alter it after a day or so. Are you serious? Nobody gets maimed or killed on a tourist jaunt (except in the Middle East). Unless he was dropped ON the North Pole the kid will never get near the place. Neither will the Caitlin expedition. Are they still floating backwards? So, skiing to the North Pole will highlight the fact that — the ice is still there? According to Anthohy’s data ice max was March 31 but the curve has inflected upward and increased again between April 6 and 7. Now on the WUWT-linked ASMR-E ice extent chart 2010 is in clear “record” territory (post-2002). That would be a satisfactory outcome for James Hansen apparently, and for many others. Their ideal earth would seem to resemble the post-apocalyptic of George Stewart’s _Earth_Abides. Come on guys! Cut the 15 year old kid some slack. He has spent the short life he has had up to now being indoctrinated at school by the likes of Al Gores film etc. Hopefully, before he hits 20, he will have come to see that he was taken in by older people, who fed him garbage. The 2003 data for March/April was the latest melt start in that JAXA AMSR-E data set. I’m following how much later this melt season is lagging behind 2003. It seems we now have a sequel to “Balloon Boy”, only this time the kid is actually in the balloon. The follow-up reality TV show will no doubt be worth missing. Well nice to see that some young people like this Parker Liautaud haven’t been brainwashed in school to believe in AGW. If he believed in AGW he would be safe at home trying to shut down the CO2 producing North Pole tourist industry which has to fly everything the tourists use from toothpaste to toilet paper hundreds of miles in and out. No problem. Actually, I missed getting the corrected value for April 4, 2010. I would like to ask him – as compared to which other of your trips? Where’s the data? “General Electric Co. installed more wind turbine capacity than rivals in the U.S. last year, but faces new competition from Asian companies, according to a report from the Washington, D.C.-based American Wind Energy Association, scheduled for release Thursday. GE installed nearly 4 gigawatts, or 40% of new U.S. wind turbine capacity in 2009, up from 3.7 gigawatts in 2008, the report said. GE sold roughly $6 billion of wind turbines worldwide in 2009, company executives say. That’s funny, Balloon Boy Parker Liautaud goes to the Arctic and finds temperatures of -34 C one day and ice “falling apart” the next. They say everybody has a double in life, well looks like Democrat Hank Johnson has finally met his twin. After this expedition has ended maybe these two incompetents could travel together to Guam to see if the island can capsize if it becomes overpopulated. The whole Arctic trips crap is becoming absurd. Next, we will have Paris Hilton doing the trek in high heels to show how climate change may contribute to knee and back problems. So let me get this straight: a 15 year old kid is ski-ing to the North Pole on ice that is ‘falling apart’. This either means he is a total moron, a green ‘crack cocaine addict’, seeking to cheat death by seeing how far he can skate on thin ice. In which case, why is his billionaire father not being taken to task for irresponsible parenting? Or he’s totally ignorant, in which case we don’t need to take too much notice of him. And we can only admire the way in which society panders to a 15 year old Trust Fund Baby who wants a bit of fun before settling down to a decade of pulling women attracted to the size of his…….Trust Fund. Maybe this 15 year old kid should have read the excellent accounts of Fridtjof Nansen and his subordinate Mr. Hjalmar Johansen from their two years expedition more than a houndred years ago before embarking on this guided tour or even opening his mouth on the subject of AGW and the arctic ice cap? Then he would at least have known that sea ice have cracks and even large areas of open water all the time – as it always has (even a houndred years ago(!)). Well, the Arctic ice cover must be falling apart when local temperatures are around -30 … -40°c and Northern Hemisphere sea ice extent is ‘near normal’ according to all avaiable sources. This GW awareness raising journey remembers me to the attempts of Lewis Pugh to reach the North Pole on kayak. In 2008 Mark Serreze, director of NSIDC forecasted an ice free North Pole at the end of the summer melt season. Mr. Pugh wanted to show the devastating effects of man-made global warming to the world, but in early September he got stuck in the ice just next to Svalbard, about 1000 kilometers away from the promised destination. He failed miserably but instead of admitting it he claimed that no one before reached the same northern latitude on kayak – this statement was plain nonsense. How are you skiing on it then? Once again, if it is falling apart how can it possibly be supporting the weight of a group of skiiers making their way on an interrupted trek to the North Pole??? You’re only 15 – how did you get the experience to know when you are on old” ice??? Better ask for a rescue then. If you are surrounded by open water, broken and thin ice you aren’t going to be making any more progress are you? Um, how do you know? If it is to your north then you haven’t got there yet and presumably its in your way – are you going home now kid? Well it would be – you don’t get to the real old ice until your pratically at the North Pole. Right now you are skiing on ice that was frozen this winter and is floating southwards towards ever warmer oceans. Naturally it is melting – which is something it does every year around this time – just when it becomes possible for a 15 year old to take a trip on the ice because its not too cold and windy. Still at -30Celsius it still plenty cold enough to freeze the blood in your toes, if not the water coming up fromt he equator (you might like to ponder on that for a moment) – isn’t it time you came home? It’s in much, much, better shape in … 2010! We’ll never read about it in the MSM, of course. This GE/Draper child-abuse stunt is precisely that – a stunt. Yes, he will return, and we will hear about all the horrors he witnessed up there – from the mouth of a child. Propoganda at its best. Or he could have read about them *and* seen pictures of what to expect. GE is, of course, a very large supplier of windmills which would explain their enthusiasm to supprt this trip. KPO (03:14:25) Sorry, maybe I should have used /humor on /off – or something. Measuring 30% + ice cover and with a colour bar on the right hand side which indicates a compression not seen in many previous years, and with an extension to within a whisker of the average predicated by by the AGW scietific community, any rational person would be hard pressed to come up with a conclusion that there is anything amiss in the arctic regional at all. Unfortunately rationality is spread rather more thinly than ice amongst global political leaders, and on today’s BBC we hear that POTUS Obama will host major world leaders on 17th and 18th April for a Climate Change conference. The press hounds are muzzled, the huntsmen confined to dragging for truth on the internet, but this fox runs on. I would never call people like these “Climate Realists”. I doubt they know the definition of the word “real”, aka “truth” or “factual”. Isn’t is *supposed* to be melting? Since the measurements of ice coverage are usually 15% (or 30%), I would expect to see a bit of ice melt at this time of year (the ‘tipping point’…). Anthony: I think it should have been snipped (and still should be). Not too long ago this kind of propaganda reporting was not possible because every newspaper had an office with desks and journalists behind it doing research to check the news on facts. Unfortunately this species went extinct due to AGW! Twenty years after the fall of the Iron Curtain we get our news served according to the standards of the Deutsche Demokratische Republik (DDR). Fortunately we have the power of the web allowing us to compensate for the current Media hog wash.
That GE bought the Enron wind turbine business has absolutely nothing to do with this propaganda, right? As for the kid and his safety, I hope he remains safe and well. If he has to get bailed out, I hope the whole bill is delivered to his parents who are letting him do this stupidity. Re Cryosphere Today –it doesn’t just look better than 30 years ago. It looks better right now than for every comparable date in their database over that entire 30 years. Check it yourself. This couldn’t be further from the truth. GE will make millions from this, indirectly. GE is a much quieter version of Al Gore. Note the other references in the comments section to GE’s investments and “influence” on green energy mandates. Joe Dumbass Public always seems to believe that windmill companies are owned/managed/operated by a really swell bunch of ex or current hippies who are out there winning one for the common-sense team. Nothing could be further from the truth. Per Jeremy’s post, if GE is in cahoots with MIT to spread this nonsense, and my 13-year old son is interested in science, will someone PLEASE tell me where they have a science program that isn’t infiltrated by activists but teach the true scientific method? I know it isn’t at our local high school where the chemistry class was forced to watch An Inconvenient Truth and asked how many people they were going to tell and exactly who they were going to tell about this important movie! And I am NOT paying $50,000 for my son to be preached to instead of learning the appropriate methods. Is there such a place anymore? Or should I just have him major in pure math? If the 15-year old doesn’t have good teachers, then of course he takes everything he is told as gospel. And if those teachers have lots of letters after their names, well… he may well be lost for good. So I’d have to guess that yeah, it could have a pretty significant impact. WHAT!?!?!?!?! He is using his *BODY* to warm his *SLED*?!?!?! I hope his sled appreciates how Parker is sacrificing his precious body heat to warm an inanimate (SP?) object. Did his guide tell him to do that? Yes, and why are there large hills if he is close to the NP? The level of corporate buy in to AGW is transparently cynical. GE sponsored the kid because his daddy is a major financial player. I admire that the kid has the guts to make a trip like this, guided or not, but I have to think that when he says the ‘ice is really doing this or that’ he is either just giving a context-free description or he is repeating what he has heard. If I was a zillionaire dad, I am not certain I would let my kid go out on truly dangerous trip like this. Nature does not really care about people who confuse their net worth with their invincibility. And at 15, one’s sense of invincibility is is quite high. 37 years of teaching 15 year olds was more than enough for me. This silly little clown will at least have his raging hormones controlled by sub zero temperatures. As far as wind farms go I doubt that GE will want to tender for this disaster. Give him a break, he is only a kid, the old saying is you are not a socialist at 20 you have no heart, if your still a socialist at 40 you have no brain. He still has time! No one got more bank bailout money than GE Credit. So they could finance the wind and solar power lunatiks. GE bought the Enron wind business which included manufacturing. They are a socialist tool. With GE/Enron wind came the sox,cox, nox and other schemes. GE is an arm of the Federallies. Is it just me, or does the picture heading this article do justice to this frozen safari? As a geologist, I’d say those rises ahead of the sledge-pulling human are statigraphically layered rock formations of some sort. Are those found in the Arctic? Why don’t they use a location-appropriate photo? Cameras all frozen up? What a joke this entire expedition has demonstrated itself to be. Yet I’m betting there are students following this daily in class and swallowing every single word. GE didn’t fund the trip. They pay promo fees and get their logos plastered on his clothing and in as many pics as possible. I am sure GE has input on what he is allowed to report. This is an example that the plural of anecdote is not data. The kid has a compelling life story but has no scientific study to report unless he wants to channel the IPCC report and use a medium like WWF or Greenpeace to make his little story of travel in the last mile to the pole. This qualifies junior to visit a zoo and write some feature cards for the penguin exhibit. More reliable this one live…. When this 15 year old made the same trip in 1980, he didn’t find any leads or open water. His extensive and thoughtful research on the subject will be included in the next IPCC report. This stunt illustrates one major problem of having great wealth: you can afford to publicize your foolishness. Cassandra King good point.And when the ice keep growing the AGW’s will try to hide the increase. You guys realize that this kid is so stupid, he thinks the entire Arctic is supposed to be covered in ice. One big ice sheet. That there is no open water, ever. Who first penned the term “plotting a trend from a single data point?” That’s what we have here — somebody who knows absolutely noting about the Arctic but instinctively knows it’s falling apart. Look at the picture. What is that structure off to the right side of the photo? It looks like there is one dead ahead of the person walking also. Seal hunting stand? Oil rig? Weather station? What is it? Maybe a buoy, remember red, right returning! Breaking apart might be more what he meant. Ice always break in the waves though. Sorry, OT, RockyRoad: you wrote on another thread that Equatorial temps rise by 5 degrees Celsius during Ice Age conditions. Would it be possible to provide links or any more information about that? wonder what he paid for his carbon credits to fly so close to the north pole so he could be the first 15 year old to “ski to the north pole” ? I have already stopped buying anything made by GE, as well as Coke. I have quite an extensive list of brands that I no longer purchase due to their shameless pandering to what is in fact a tiny minority of their customers. Folks should pay close attention to which brands they purchase and not buy anything from those that are supporting the AGW myth. Nor any company that makes ridiculous claims of “being green” for merely pumping buckets of cash into the WWF or the Suzuki foundation et al. The real number of those that would boycott a product for not being green enough would start out at perhaps 10-15% and rapidly drop to below 5% after a few weeks and fizzle completely in a short time. Most AGW “believers” lack any staying power or focus really. Besides, nowadays its all about appearing to be green; not actually being green. A boycott from those who like most of us have had enough of the crap surrounding AGW hysteria would turn out to be as many as 25-30%! Probably increasing as time goes by and the movement gathers momentum. It is well past time to start turning the tables on the Carbon Crazies by withdrawing their funding! Stop buying stuff from the companies that give these loons their money! GE is to Washington what Gasprom is to the Kremlin. I’ve been looking at historical events and comparing them to certain factors and have come to the conclusion the Holocene Interglacial ended about 500 AD and all we need is a Heinrich Event to show all these silly people where we are really at. Despite the fortunate blips of the MWP and in the late 20th century (Modern Solar Maximum), we are drifting colder and I have my fingers crossed we have a millenium to understand that. Ancient Weather … toward the bottom. It seems people pick up on cues from one another and you get parallel enquiry. Really quite good … talks about ‘Climate Change’ in a very general way … so far. What a catastrophe that so many of the pampered generations of the “Western” societies are willing to learn so little about their existence prior to their surrendering theirs and future generation’s opportunities to the perennial exploiters of others and their own gullibility’s (including scientist and non-scientist AGWer zealots). At least we have experienced a significant, if temporary, reprieve with the Net Neutrality ruling reprieve. Onward WUWTand associates! I wonder about the obviously human built structures in the picture? Perhaps they are oil derricks? Or maybe observation platforms for the lifeguards that are there in the summer. Just to clear some confusion, I don’t think that this trip has been specially organized. A couple of years back the daughter of a work colleague was sent by her company (a major UK high street bank) to the North Pole, via Canada. Apparently it is a regular trip (annual?) that companies with too much money can send employees on as some sort of ‘management training’. She came back with a lot of photographs of snow and the occasional polar bear (photos of, not actual bears) – just the sort of thing that will prove vital in her job as an HR executive. I am guessing that this is the same trip. @RockyRoad (05:43:31): Did you notice the obviously man-made structure on the right edge of the picture? And a similar structure in the background just to the right of the skiers head? On my many (long-past) “free trips” to the area (provided by the USAF – they even provided Parkas and free coffee!!) from a bit “higher” perspective, I agree. The polar area didn’t look like this at all. Pete, I understand your comment and that it can be taken out of context. I did not say I wished his death. I do not wish that at all. I merely said I’d not be sad if it happened and his father was sued. At least one other here suggested this was a form of child abuse. And it is. i.e. Using a child for promotion of oneself and religious beliefs about AGW. Steve, the kid is reporting “open water” while looking at channel markers. Both area and extent are now normal or above normal. I don’t own a lot of GE stock, but I just voted against Immelt on the GE stockholders meeting proxy. If enough do so, maybe we can get rid of him and have him move on into his full time job in the Obama administration. Just so everyone knows, Dad rocked at the U of Victoria !! Safe and sound and Weaver nowhere to be found !! He had some great questions and handled them all. Dad has some real cajones to walk into the lion’s den and the cowardly lion was too scared to show. Someone in the crowd said that Weaver “couldn’t be bothered to debate with a minor player”. The rest of the crowd let him know what they thought of that statement. A lot of them were computer modelling students of Weavers, and did not bring their knowledge of the climate (if they have any). They were defenseless. Many had believed what they read on the internet (read DesmogBlog ) about my father ( eg, faked doctorate) and were quite unprepared for strong scientific arguments. It was a good day!!! The media is in the Advertising/Entertainment business. “News”, or what we expect to be news, is of the quality we, collectively, desire in order to continue subscribing to the advertiser/entertainers program. The media is now accessible to almost everyone and almost everyone has money to spend, so don’t expect the quality of “News” to improve. It just requires more effort to sift through the garbage to find information. Parker L. is merely an interesting prop. As is CAGW for that matter. P.T. Barnum (I think): Nobody ever lost a dime underestimating the intelligence of an audience. Catlin reports that the Arctic is cold. Climate science is taking us to unimaginable new places in the 21st century. So now people’s understanding of science is so bad that they can’t figure out ice doesn’t melt at -34F … And there must be some other reason, like wind or ice movement that is making the ice crack up around him? Where do the mountains in the picture with their obvious man-made structures come from out in the Arctic? One of the typical journalists tricks is out of context photos, like the ones made of the obviously not stranded polar bears to get to people’s emotions. Unless people reboot their brains, we are in trouble. You people really don’t yet. Good point. 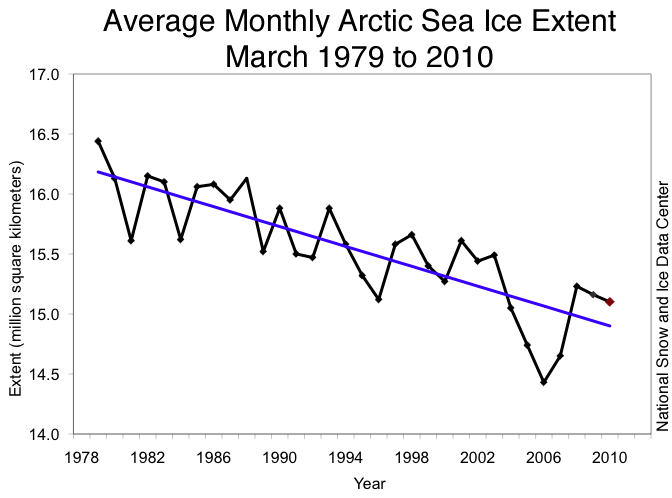 Arctic ice has declined all the way to above average. I avoid GE at all costs these days. It’s Fascism as they are getting closer and closer to the US government. No, we don’t yet. Your point beeing? Just a thought – isn’t the ice due to start to melt bigtime about now? Not sure it was a good idea to set off at this time of year, didn’t those idiots…err… dedicated polar explorers at the PratlinCatlin Team try this stunt last year & got stuck – miles from the NP? Does no one ever learn? Wonder if young Parker has his body metabolism all wired up somewhere too? BTW, just had my electricity bill in today, (on top of the woodburner, & portable 15kg cylinder gas fires, price has doubled in 2½ years from £15.50 ($25US) a pop to £29.99 ($50US) a pop! ), it’s “WOW” time, you know, the sort of figure that comes half way between a “sharp intake of breath” & “OUCH!” However, it is partly commensurate with length of use over this last winter, I thank the Lord that I am as far south as I am. The shape of things to come I fear, so it looks like I am going to have to do some serious budgetting for the next “as mild or milder than average winter” later this year! Really interesting to watch General Electric openly support this kind of thing. They’ve been betting heavy into energy-saving everything and it would really bite them if all of that fell apart. This is a visible example of a corporation quite nakedly supporting a hysteria that helps their bottom line. The kid’s probably having good time but I bet the butler’s really pissed off. Are you all kidding, this is a great spend by GE. First I bet you will see a TV special about it on GE’s NBC, but more importantly GE is one of the companies best poised to gain the most from carbon taxing, so this will be a great propaganda showcase. What’s up with that huge decline in ice on Feb 20th ? Isn’t February peak suicide season in Norway ? Are they going to hide that decline later ? Anyone that makes mistakes, can’t be trusted. OK George… you owe me a new keyboard and a bottle of screen cleaner. That *required* a warning “empty mouth of all liquid before reading” alert. Came close to needing new underwear too. Congratulations for a brilliant post. It doesn’t count, because 2009 was the warmest year *evah* in the Southern Hemisphere. The pictures show a lot of man made structures on the slideshow on the examiner. Son, don’t let the silver spoon freeze to your tongue. It will hurt like touching your tongue to the flagpole up there. Apparently it is okay for the Arctic to have a 30 year process in one direction, but if there is evidence of a 30 year process starting in the other direction, that must not be talked about until 30 years later. Healing doesn’t count until “healed” is achieved, and only wild-eyed zealots would dare talk about it while in-process. Catlin probably also needs to report the intrepid explorers have been drifting farther away from the pole in the week it took them to figure out how to build an outhouse on an ice floe. From the book ”The third man” (Norw. “Den tredje mann”) by author Ragnar Kvam Jr. on Nansen and Johansen’s expedition to reach the North Pole, 1895, more than a hundred years ago. The book is based on the official log books, the published accounts and the private diaries of the two men. The two guys were some 2 years alone on the ice, unassisted. “They strived through a mess of open water areas and ice. With fingers bleeding from frostbite, sleds rolling over constantly and dogs already starting to wear out. Nansen had been sure that the ice would improve the further north they came, and that temperature would rise now that they had waited with the start until mid March. But the ice got worse, and the cold would not let up. Already after a week, they almost lost their courage. They went between blocks of ice that eternally scraped towards each other, driven by the forces of the sea that had once created them. The big ones crushing the smaller ones, running them over or pushing them out into the next open channel in the ice. When ice blocks collided, they could create towers and ridges teten meters high. Eight days after leaving Fram, Nansen measured the declination of the sun. It showed that they had reached 85o 10’ N. That meant a total distance of one hundred and thirty kilometers the first week, or average daily distances of sixteen kilometers. Even though they would need to keep a higher speed if they were to reach the north pole, they were so pleased they celebrated by rigging up a flag o none of the kayaks [Because the ice cap always have large open water areas and channels, they pulled sleds with kayaks strapped on top. All the gear was packed in the kayaks which they used to cross the open water areas]. One week later, March 28, Nansen measured their position to 85o 30’ N. That meant 37 kilometers, or daily average of a mere 5 kilometers. [ice drift working against them]. A disappointed Nansen believed that there was something wrong with the observation and refused to accept the result. But only new observations would provide an answer. In the mean time, they strived on. They were no longer just fighting intense cold and ice. Ever more often, they ran into open, treacherous water. Suddenly the channels of open water were more an more common. Of ice ridges and open channels, the open channels were the worst. This was 1895 than one hundred years ago. The CAGW-guys have no sense of history (except when it fits (or is made to fit) their agenda of course). I think one thing “we people” do “get” is putting a linear trend to a cyclic process is not too smart. The picture has been taken in the middle of Longyearbyen, Svalbard – a town of about 2000 inhabitants at 78N. That’s were the north pole tourists are picked up for their flight to 89N. It travels to different parts of the world in drought. They have the right whining tone of voice. It mentions several spots of drought before the rainy season. Just like taking poley bear pictures in the summer and infer it is winter. I learned this the hard way. When I was young, I saw the poor kids in mexico begging. My relatives told me they could make more money than their parents. There is a lot of flock fleecing media outhere. …you know, if these idiots would just let the young Arctic ice alone instead of “studying” it (stomping all over it, cutting through it with ice-breakers to measure how rotten the ice is etc.) maybe the newest ice would have a chance to consolidate a bit more? I’m surprised there aren’t teams of climatologists camping out on the ice, building bonfires!! Because snow and ice are melting later than 30 years ago, Tom describes the cryosphere as “looking better.” Anthony does this on occasion too, evaluating the situation from an “even if you accept that there is a global warming danger” point of view. But talking in terms of the alarmists’ presumptions means being oblivious to what the alarmists are oblivious to. Given that the real danger is global cooling, late melting (in the face of a full on El Nino no less) is objectively worse, and could even be considered ominous. We know that cooling is coming, both on account of our relatively quiescent sun, and from the ending of the El Nino, which could mark the end of a 30 year warm phase of the Pacific Decadal Oscillation (declared over by NASA in 2008). Add that this year’s late melt is not just a sign, but is causing global cooling as we speak. That huge remaining snow and ice extent is reflecting away massive amounts of sunlight, actively compounding the other cooling forces. Expect a cool summer and a cold winter. I’m predicting the first snow in fifty years where I live in Palo Alto. Well, I predicted the same thing last year too, but it got put off by the El Nino. That heat dump has been cooling the ocean for the past year, making snow more likely going forward, on top of to belated solar uptick and the prolonged ice and snow reflection. 2 gets you 3 Palo Alto has a snowball fight next winter. So, he says he wants to bring attention to the ice melting by walking out on the ice he believes is melting? Did he bring his swim suit? Don, I did the same thing. I bought my GE stock many years ago and have decided to keep it until it recovers. Maybe I’m acting against my own interests, but I voted in favor of every Board of Directors candidate except “I’m Melting” Immelt, whom I voted against. I also voted opposite to the BOD recommendation on every proposal. I’m also trying to send a message. THIS BOY’S FATHER, BERNARD LIAUTAUD, IS AN ASSOCIATE OF AL GORE. RESPONSIBILITY FOR ALL OF THIS CAN BE LINKED TO GORE PERSONALLY. Your comment made me laugh and spew coffee out of my nose. You owe me for a new keyboard, dude. That saying ain’t that old, and I consider it an artifact of our “modern” age here in the “Western” world. At that young age you are surrounded by the loving embrace of caring parents who provide everything for you, or severely questioning why the heck not since all the other kids have them. This is followed by the at-least four year experience of other people mostly caring for you as you continue learning as you’re used to on your way to acquiring the golden piece of sheepskin that will lay the world at your feet ready for you to conquer. It’s such a wonderful time, you wish it could go on forever, and everyone else should have the same! A question for the statisticians: given that snow and ice extent has a very significant albedo effect, should it be possible to discern this effect in the temperature data, or is there too much auto-correlation with the causes of snow and ice extent to separate the albedo effects out? If warming and cooling were uniform, so that snow and ice extent was a direct function of average temperature, then I’m guessing they would be very difficult to separate. Albedo cooling would only show up as an acceleration in the cooling that caused the increased albedo in the first place. But if cryosphere extent is strongly influenced by weather as opposed to climate, then it would sometimes have an effect opposite in direction to average temperature. Would that make it easier to discern? I’m guessing that all such effects occur on such short time frames that they cannot possibly be separated out from the dominant effect that ocean oscillations have on short term temperature variation. As long as this twerp doesn’t drift into Canadian territory and we have to rescue him, let him risk a few fingers and toes. I hear hippie chicks are into to guys like Django Reinhart. Well, that is what happens when you dilute at more than 50/50 Prestone. A Canadian-led team of scientists has supplied a rare piece of good news about Arctic wildlife after developing a new system for counting narwhals that doubles the estimated population of the spiral-tusked marine mammal in Canada’s northeastern waters. The revised count is particularly encouraging because the narwhal — inspiration for the ancient unicorn myth — was recently identified in an international study as the animal most vulnerable to the impacts of retreating Arctic sea ice, a phenomenon generally viewed as deadliest for polar bears. This is the first time I’ve seen a reference to Django on WUWT! Here is a rare bit of footage of the genius in action. I sold my GE stock. Now I need a shower. His point is that God created the Earth in the year 1979. Obviously. On April 11 2010, Doug Stoup, Dennis Garcia and Jack Ashton will begin their expedition to the North Pole as part of a trek for peace. For Dennis, this adventure will complete his goal to walk to both the North and South Poles, a challenge only accomplished by an exclusive group of less than 100 adventurers on the planet. Jack will be using this year’s expedition as training for a more ambitious expedition he has planned for February 2011; a 600 mile trip from Ward Hunt Island, Canada to the Geographic North Pole. This will be Doug’s 10th expedition to the Geographic North Pole. The temperatures at the pole this year are warmer than ever recorded. The team will likely face thin ice conditions and open water leads which will add to the challenges already present; large pressure ridges, up to -50°C temperatures, and drifting ice. The team could easily fall victim to the treadmill effect, travelling long days pulling their sleds towards the pole, only to have their efforts undermined by the ice beneath their feet drifting in the opposite direction. An expedition of this kind demands an intense level of physical and mental fitness. Follow their trek and listen to their daily dispatches here. For Dennis, this adventure will complete his goal to walk to both the North and South Poles, a challenge only accomplished by an exclusive group of less than 100 adventurers on the planet. Because, after all, feats like climbing to the top of Mt. Everest are now so dead-common ordinary they’re not even worth doing anymore. The entire planet is now so depressingly normal there’s hardly any challenges left. Guess “less than 100” will have to do. Glad you caught my mistake, Harold. I should have said “drop” by 5 degrees Celsius. And while I’m at it (and from my perspective as one who lives on a desert that only thrives because of irrigation from nearby mountains) it amazes me that those so worried about warming in their climate change scenario would, apparently, rather have cooling instead. And why is that? Well, they obviously believe in “Climate Change” or they wouldn’t have hijacked the term for their movement. *) More CO2 in the atmosphere so plants do better, and if plants do better, so do animals and humans that feed on them. *) Summers are longer and winters are shorter. Yes, I ski, but only because there’s little else to do while my favorite trout streams are frozen over and getting down them by canoe is impossible. *) More arable land: Ice records show much less dust during an interglacial, indicating the land hosted a larger portion of plants that kept the dust in the soil rather than in the air. *) A wetter climate overall–more water for humans, plants, and especially fish. *) Less CO2, even to the point that plants have a hard time surviving. *) Less arable land, with the problematic survival of much of the earth’s population as crop yield drops precipitously, farmland area shrinks, dust becomes a problem everywhere. *) Less moisture, and much of what comes down piles up and eventually bulldozes your house and grinds it to sawdust. “You say that there are thousands of scientists that have made up their minds that AGW is a fact. There are also thousands who haven’t. From reading the literature of those who have, I find that a reasonable number are not convinced that more than a fraction of the detected warming of 0.6 deg C over the 20th century was a product of the man-made contribution. Similarly, a number of the AGW skeptics are not skeptical of the small influence that GHG emissions have on climate. Much of the debate is on what weight to give to each of the factors influencing climate. In other words, nature exceeds man’s puny means and ways by 10,000 to 100,000 times over. That’s a very humbling statement, but true nonetheless. But let me add this: The prospects of another glacial epoch are so horrendous that this geologist would almost join the hysterical “Climate Change” folks if their projections indicated another ice age were imminent. Almost, because again, man is pretty much a spectator. Jimmy Haigh: Nice! Thanks. Is there video for Minor Swing? Where is the children protective services? Yes! I’m a big Django fan (have 6 CDs of his music). He plays better with the two fingers on his left hand (his other two were permanently injured in an accident) than I could ever hope with four (not counting my thumb)…certainly a genius of jazz guitar. So taking 15 million square km as the normal max ice, and 6 million the normal min ice, that means 9 million square km of ice must melt each summer, so there must be 9 million squ km of new ice each year out of a total of 15. Or first year ice must always be 1 1/2 times multiyear ice. on average of course. And looking at that typical arctic sea ice picture with the kid towing his belongings, and trying to dodge the open water leads; he hasn’t even noticed that some of that newly formed sea ice, has actually dug up the bottom with it, and has put some huge rock boulders up on top of the ice. And I see one of those “Red Right Returning” channel buoys out there for the north west passage ships. Wonderful experience, being out on the open sea ice like that. OK, so now I am aware. Next! This stupidity is just piling up. Yes the kid has been propagandized into thinking that the arctic is just one continuous ice sheet, never mind all the expeditions that went by boat or submarine, or the hazards of doing so. These kinds of stunts are nauseating in addition to stupefying. Everybody who thinks about this gets stupider. It really is the “environmentalist” version of making your kid a suicide bomber or something. Hey, guys, let’s not pile on the poor kid. Everybody gets to know everything once in his life (for me it was at age 16; I was a late bloomer). And let’s go easy on GE, too, because…um…well…OK, because I own stock in GE! Let the kid live in the Arctic area for about 40 years and then he’ll learn something about what’s normal and not normal in the Arctic… ask any of the Inuit peoples up there. Most of them are claiming MSM and research studies are exaggerating the “unprecidented” warming. They claim the melt(s) are far from being unprecidented and nothing out of the ordinary. They have many ancestral stories passed down through the generations that tell of similar stories… when the hunts were good, when they were bad, and the changes in climate/temperatures/winds directly related to animal migration/procreation. I remember many of these stories as a child. I’ll believe the Inuit who have lived there for generations over ‘scientific’ tourist researchers any day, thank you very much. All the ice on the North Pole, South Pole and Greenland ice is melted. Scary? Nah.. This is the best false premise in the AGW is that oceans will rise due to ice melt. First the North Pole, which is floating ice with 3km at the thickest. Ice cubes are bigger than the water they started from. South Pole and Greenland geological configuration under the ice look like two big pools. If all the ice melted, the resulting water would simply stay there much like an atoll. National Geographic April 2010 mentions that all the water in the planet 97.5% is salty, 2% is frozen and we use less than 1%. By surface oceans occupy 70%. Do you think 2% in volume would do that much damage even if the South Pole and Greenland wouldn’t hold water at all? Around here, at least once a year, a body is retrieved off of Mt. Shasta. Just had one last week. If warmists keep up this rant about balmy Arctic conditions, one of these ‘new Arctic Explorers’ is going to eat it. Brazen and Bold meet Hostile and Unforgiving environment. The Arctic is not a playground. Geo E. Smith wrote Or first year ice must always be 1 1/2 times multiyear ice. on average of course. Yes it seems so. No one has addressed this “new ice: old ice:” issue. It IS on one chart somewhere. I had written above your comment: There are all sorts of references to multi-year sea ice and how it is ever lower. Yet every year the max ice goes to ~ 14 million sq km and in summer it drops to about 5 million sq km. (Give or take.) So EVERY year about 2/3s of the sea ice disappears. Ergo every year about 2/3s (+/-) of the winter sea ice is new. So what is the real story on multi-year sea ice? Seems to me there is never more than 1/3 that is multi-year anyway. One understands that it is not always the same 2/3s that keeps melting, but still, something seems amiss in this “old-new” ice argument. This is the only video of Django playing I’ve managed to find. There are lots of you tube videos featuring Django’s playing but no other good footage. Listen to his version of ‘I’ll See You in My Dreams’. The kid is FIFTEEN for crying out loud. He’s been wet nursed on junk science. Plus we all know that “GE brings good things to life” … right? Ease up everyone, he is only fifteen and the Arctic must surely be a very uncomfortable place to be, quite an experience for anyone whether rich or not. It is an adventure no matter what the true reasons for it. At fifteen it was all I could do to bucket up the snow slopes of the Berwyns above Pystyll Rhaeadr falls in mid-Wales in March. A trip to the Arctic would have been ‘out of this world’. And I wonder how many 15yr-olds read this site and have seen the assertions of the young man’s ignorance, idiocy …. Do their fathers use such words about them?? Best concentrate on belittling the sponsors (GE) and the true idiots who have brainwashed the young man. But let him learn the inevitable lessons in peace. Due to insurmountable conditions, Parker has ended his skiing quest to reach the North Pole and will fly there by helicopter tomorrow. The new realitys:fire does not melt steel and cold does not freeze water. When faced with insurmountable conditions, overturn the table and declare victory. You mean like home inspectors required by law to certify compiance on all appliances when you sell your Home? Just as a coincidence, GE sells all the energy star appliances. Lighting, monitors, flourescent bulbs etc. stoves, furnaces, hotwater heaters. GE and Intel Corporation announced an alliance to market and develop home-based health technologies that will help seniors live independently and patients with chronic conditions manage their care from the comfort of their home or wherever they choose. GE recently announced that it will spend $3bn over the next six years on healthcare innovation that will help deliver better care to more people at lower cost. So the same GE will be the smart link between the Obamascare cube farms and the healthcare providors. What could go wrong? GE will engage experts and leaders on policy and programs and create a GE Health Advisory Board, which will include former U.S. senators Bill Frist and Tom Daschle and other global healthcare leaders. So GE will control the light switch in an illumination sense and turn off the light switch in a medical sense? There is a lot of legislation that drives business for GE!!! The photograph was taken on the frozen river in the town of Longyearbyen in Svalbard looking South. Longyearbyen was originally a coal mining town and the ‘towers’ that can be seen are part of a now derelict cable car system for transporting coal from the mines to the harbour. Also in the left of the picture we can see dark objects which are buildings along the road connecting the town centre with ‘Nybyen’ which was originally miners accommodation. I stayed in Nybyen in 2008 and 2009. Clearly the photograph is posed rather than being part of his journey on the ice. It might help your readers if you explained what we were seeing. What are the comparisons of the two photos that we should be focusing on? What features support the assertions in your post? Only if the ice is stationary George. These days the area goes from ~3Mm^2 to ~14Mm^2 so only 20-25% of the previous year’s ice remains assuming no movement. However, drift of ice during the winter out of the Fram must be replaced by fresh ice, suppose 1Mm^2 of old ice (number chosen for illustration purposes) flows out that way then you’d only have 2Mm^2 of old ice (~15%). As I recall MY ice is currently ~1.5 Mm^2 so those numbers should be about right. Is that what they mean by green jobs?